Note: This piece was originally written in August of 2006 when the price of a barrel of oil stood at $78. Now with the price around $100, some are suggesting $150 is within reach next year. Many economists opine that the US policy of allowing the US dollar to devalue has contributed to the rise in oil prices. I agree. With crude prices hovering around $95 per barrel and sticker shock stunning everyone when they pull in to fill up the ol’ SUV, we once again hear politicians moaning about “dependence on foreign oil”. Some of us are old enough (and not yet senile) and can remember hearing this same refrain back in the early 70s when shortages and gas lines at the stations gave the “driving public” which is nearly everyone, a wake up call. So what have our elected leaders done in the last 30+ years since to alleviate our dependence on foreign oil that in large part comes from the historically volatile Middle East? Well, nothing. In most cases they have made things significantly worse. They have not allowed drilling for oil off our coasts, on public lands in the western US where the government owns most of the land, or in the much discussed Artic National Wildlife Refuge. If this desolate place were more appropriately called the National Artic Wasteland it might be less controversial. Nobody is going to go there willingly and the few caribou that wander through there from time to time could easily be accommodated, but the environmental lobbies have made it their Waterloo. By threatening to withhold their contributions and votes the professional tree huggers have cowed liberal Democrat Senators to continually vote against even looking for oil there. Stupid? Of course. Understandable? Yes. The Democrats know that if they lose the environmentalist vote, the trial lawyers or the Black vote that they will be forever consigned to irrevelance. So screw National interest… getting re-elected is more important. Unfortunately, preventing even looking for oil at home is not the only anti-energy independence path our politicians have taken. Refusing to swim against the tide of fear and hysteria following the accidents at Chernobyl and Three Mile Island, our leaders have not allowed the construction of a single nuclear power plant in more than a generation. Ignoring the fact that France gets some 70% of its electrical power from nuclear plants with no environmental problems, politicians are afraid to promote its use. Worse, increasingly restrictive air quality regulations have forced many power companies to switch from coal to natural gas and petroleum thereby increasing demand and dependence. If the environmentalists were truly concerned about carbon emissions and global warming they would be actively promoting the building of nuclear power plants and encouraging the utilization of the Yucca Mountain waste repository. That they do not speaks volumes. As we watch the dollars ring up on the gas pump when filling up we should also keep in mind that our fearless leaders and the “NIMBYs” among us have prevented the construction of a single gasoline refinery for more than a generation. The existing ones operate at full capacity all the time and even a small hiccup causes shortages. A major curve ball was thrown at the industry when Congress caved to the agriculture lobby and recently passed restrictions on the use of chemical additives in gasoline and mandated the use of ethanol instead. Predictably they had ignored the warnings that there were insufficient quantities of ethanol or adequate delivery methods to keep the refineries supplied. 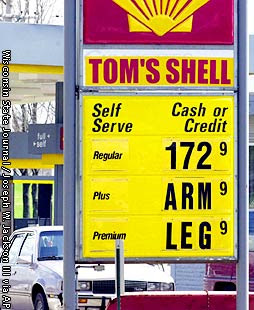 The unintended consequences, of course, were shortages and higher prices at the pump. The environmentalists are quite happy with the current situation. They would be very pleased to see gasoline at $10 per gallon. Then people would stop driving their cars. As my wife so succinctly pointed out, “They want everyone to go back to riding bicycles”. Yes, and they want everyone to live in shacks without electricity and grow their own vegetables. I’ve got no beef with someone who wants to do that, but given today’s urbanized interdependent World, few really want to go there… at least not willingly. The huge problem with the situation today lies not in the price of a gallon of gasoline but in the strategic dependence on Middle Eastern oil that fuels our economy. Huge amounts of petro-dollars flow into the coffers of despotic Middle Eastern governments who are quite happy to fund increasingly fanatical Islamic movements bent on the destruction of Western Civilization. Most of these governments have no economy save the oil that lies beneath their deserts. Were we not dependant on their contribution to the world oil supply and hence our economic health, we could simply say to Iran “Stop your nuclear develop-ment and funding of terrorist groups or we will shut down your ability to ship oil”. With little impact on our economy we might actually have the balls to do it and their economy would collapse in a matter of months. Regime change would follow without us having to expend our blood and treasure in an armed confrontation with them. Many Americans would like to believe that withdrawing from Iraq and negotiating with Iran would avoid an eventual nuclear confrontation with radical Islam. This dangerous wishful thinking can lead to disastrous consequences in the future. If, as I predict, the Democrats return to power in ’08 on a “peace” and environmental platform, America will be more dependent on Middle Eastern oil four or eight years later. A nuclear armed Iran and its terrorist surrogates will hold a very powerful gun to the head of the Western World. Should a nuclear exchange or terrorists delivery of nuclear devices render large cities and swaths of America unfit for life of any kind for generations, what will the Serria Club have to say about the plight of the Arctic caribou? During our long standoff with the Soviet Union we relied on MAD, Mutually Assured Destruction….. you fire missiles at us, we unload on you… end of civilization. No rational human being wanted that. But, we cannot be quite so sanguine about the rationality of the Islamic radicals. People who are quite convinced that heaven awaits those that blow themselves up in a pizza parlor full of women and children cannot be relied upon to pause before blowing up say, New York City, even if we threaten to nuke their entire country. And, they are reasonably certain that if a terrorist supplied by them did it, we’d probably not strike back anyway. Our only way out of this box is a full-scale oil exploration of the entire North American continent and seacoast. Yes, new technology and alternative means of supplying our energy needs must be developed. But, we can’t wait for the magical arrival of undiscovered technology. New sources of oil must be found in the US, Canada and Mexico. Nuclear power plants must be built without endless delay. In five years we could be free of Middle Eastern oil and the political dynamic would be vastly different. Do we have the will? Oooh, oooh! I love this can of worms you've opened up. Most intelligent people within North America, Europe, Australia, etc. know that although oil is finite that we can't quit cold turkey. What surprises me is how many people are oblivious to the fact that plastic, fertilizer and many other products taken for granted in our society are petroleum based. I agree whole-heartedly with the idea of people carpooling when necessary and other practical approaches. But we NEED to continue oil research and production. Having our own supplies to draw from (actually we do, they're just untapped) makes so much more sense than continuing to deal with the middle east quagmire. This act would do more for homeland security than another sham law imposed to date. I say drill away. And of course we should continue researching other fuel sources. We'd be foolish not to. What many environmentalists fail to recognize or acknowledge is that the rapid increases in human population worldwide are the major factors in drought,animal extinction, etc. Not everything can be blamed on yuppy consumerism (for the record I don't do yuppies either). The SUV driving crowd is an easy target. Afterall, who hasn't been annoyed by some jerk in a hummer weaving in and out of traffic will yacking on a cell phone. And we do live in a guilt-driven society. Now that the general populace in densely populated countries such as India and China are able to purchase cheap automobiles, the demand for fossil fuels will skyrocket. I could be mistaken, but I seriously doubt that a $2,000 box on wheels comes equipped with a catalytic converter or other emissions controlling devices. So while the eco-nazis at home rant and protest about how horrible our society is and how we are single-handedly destroying Mother Earth, the smog levels, etc. over Beijing, New Delhi and the like will be amassing at breakneck speeds. But will the granola crunchers protest over there? Heck no, they'd be ran out and told to piss off. Here, for some strange reason, politicians listen to these loud-mouthed, senseless fools. I've not done the math (not my forte) but if crude oil prices in the 1970's peaked at approximately $75.00 a barrel and the price of gas per gallon was under $1.50 then that brings several questions to mind. First, what happened to cause the end product to go up so disproportionately over the decades and second, considering inflation, cost of living, etc. weren't we paying a larger portion of our net income for fuel then than we do now? I'd consider riding a bicycle, but I want one of the old Schwinns with an extra wide, comfy seat. A tractor seat would be preferable. On a lighter note, the other night while watching the news my middle daughter piped up and asked if Obama was the man behind the 9-11 attacks and if so then why were people voting for him. Her sincerity and concern were genuine and added some levity to the evening. I finally found this article, good reading. Reminds me of the time years ago when I was working in the oil fields. The drilling was discontinued and existing wells were capped because the Middle East oil was cheaper. The powers that be said if we ever had problems we could uncap and drill again. I guess gasoline at $4.50 per gallon isn't a problem to our elected officials, but it's sure putting a bind in most American's pockets. I wonder if our government officials would car-pool with some of us and let us ride in their limos or share their jets as they fly all over the world? Don't hold your breath!